Birchbox turned three this month and curated a killer box based on 'heritage'. The products are fabulous, and I'm especially hooked on the Caudalie hand cream, the benefit sugarbomb lip gloss, and the Ruffian polish. Okay and the Curl Keeper too! Want to see each product in better detail? Birchbox September Review. Glossybox curated a collection of 'All You Need For Fall' and there were some awesome products. However, half the value of the box was the Nioxin (which I'm not really into). I love the other products to death (already! ), especially the new BCBG fragrance (which shockingly is the only product that wasn't full sized this month!). Want to see my review? 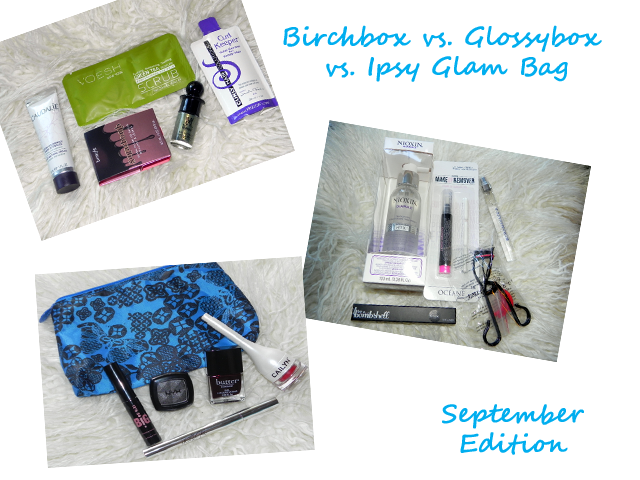 Glossybox September Review. Ipsy had a 'Classic Beauty' theme and included everything you'd need for a beautiful, classic look. Every product is amazing, I love the Cailyn lip balm expecially - it's a great matte red lip. Want to see each product again? Ipsy September Review. Is clearly Ipsy. For only $10, I received everything to create a complete, classic look using products that are amazing and I will use on a regular basis! I mean, how adorable is the mini Butter London polish? Birchbox gets my vote for silver, because I seriously LOVE the products but am just disappointed in the *something more* it was lacking, imo. Glossybox gets the dusty bronze, because its $100+ value is quite deceiving. Taking away the $50 Nioxin and the $30 eyelash curler, the box is only worth its cost of $21. Hopefully next month's box will be better!